The largest leatherback sea turtle ever recorded was over 8 feet long and weighed over 2000 pounds. 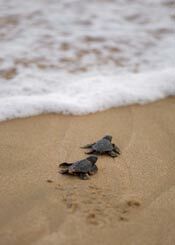 Leatherback sea turtles produce the largest eggs and hatchlings among all sea turtle species. Leatherback sea turtles are the largest sea turtle and the largest reptile on our planet. Leatherback sea turtles swim five times faster than the fastest human the world. Please report any marine animals in distress to the Sheriff's Dispatch 904.824.8304.